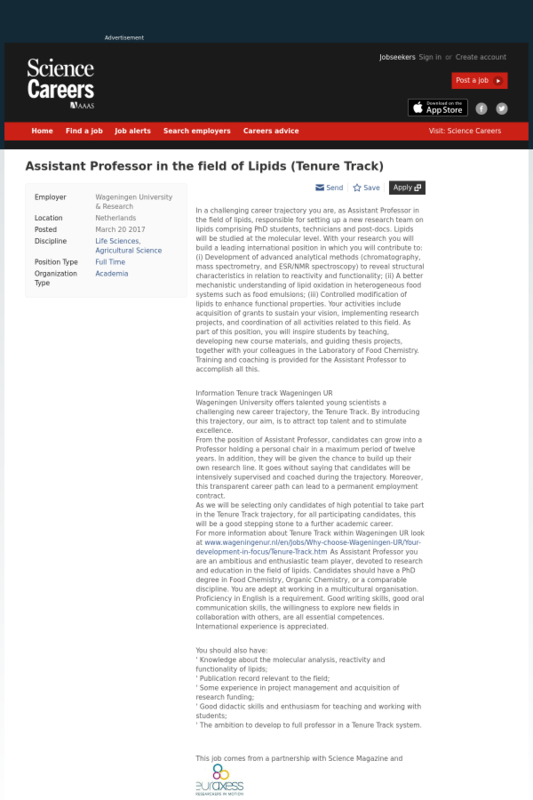 In a challenging career trajectory you are, as Assistant Professor in the field of lipids, responsible for setting up a new research team on lipids comprising PhD students, technicians and post-docs. Lipids will be studied at the molecular level. With your research you will build a leading international position in which you will contribute to: (i) Development of advanced analytical methods (chromatography, mass spectrometry, and ESR/NMR spectroscopy) to reveal structural characteristics in relation to reactivity and functionality; (ii) A better mechanistic understanding of lipid oxidation in heterogeneous food systems such as food emulsions; (iii) Controlled modification of lipids to enhance functional properties. Your activities include acquisition of grants to sustain your vision, implementing research projects, and coordination of all activities related to this field. As part of this position, you will inspire students by teaching, developing new course materials, and guiding thesis projects, together with your colleagues in the Laboratory of Food Chemistry. Training and coaching is provided for the Assistant Professor to accomplish all this. Wageningen University offers talented young scientists a challenging new career trajectory, the Tenure Track. By introducing this trajectory, our aim, is to attract top talent and to stimulate excellence. From the position of Assistant Professor, candidates can grow into a Professor holding a personal chair in a maximum period of twelve years. In addition, they will be given the chance to build up their own research line. It goes without saying that candidates will be intensively supervised and coached during the trajectory. Moreover, this transparent career path can lead to a permanent employment contract. As we will be selecting only candidates of high potential to take part in the Tenure Track trajectory, for all participating candidates, this will be a good stepping stone to a further academic career. For more information about Tenure Track within Wageningen UR look at www.wageningenur.nl/en/Jobs/Why-choose-Wageningen-UR/Your-development-in-focus/Tenure-Track.htm As Assistant Professor you are an ambitious and enthusiastic team player, devoted to research and education in the field of lipids. Candidates should have a PhD degree in Food Chemistry, Organic Chemistry, or a comparable discipline. You are adept at working in a multicultural organisation. Proficiency in English is a requirement. Good writing skills, good oral communication skills, the willingness to explore new fields in collaboration with others, are all essential competences. International experience is appreciated.
' The ambition to develop to full professor in a Tenure Track system. Associate Professor in Entrepreneurship (1. Assistant Professor International Relations of East Asia (1. Assistant Professor Globalisation Studies and Humanitarian Action (1. Assistant Professor International Relations & Critical Security Studies 1. Assistant Professor Geopolitics and Connectivity (1.